A NEW GERMAN LIGHT PLANE: The "BAG E.l" Bahnbedarf Darmstadt on which recently Herr Botsch flew from Darmstadt to Johannisthal (Berlin), a distance of 310 miles, in 3 1/2 hours. This photograph gives a good idea of the engine cowling, wing attachment, pilot's cockpit, etc., of the Darmstadt "BAG E.l." The engine is a Blackburne. 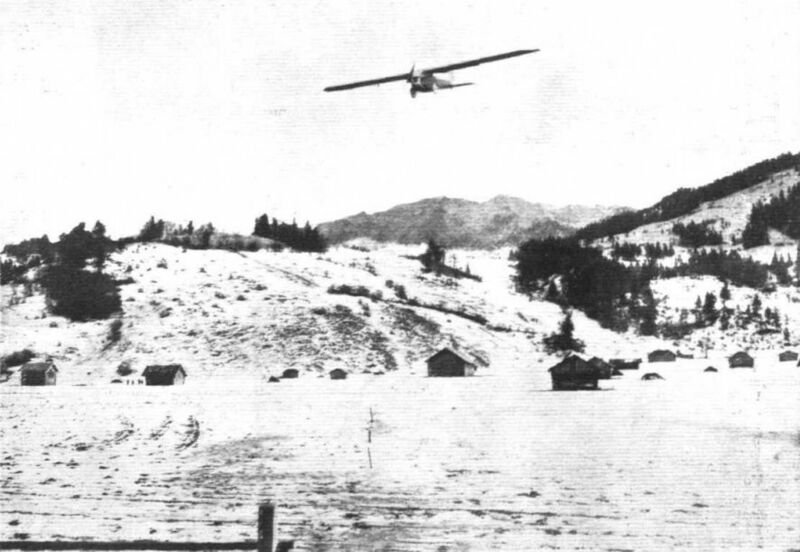 WINNER OF THE ZUGSPITZ FLUG: Herr Botsch on the Darmstadt Bahnbedarf E.I, with Blackburne "Tomtit" engine en route to the Zugspitze. THE NEW JUNKERS THREE-ENGINED MONOPLANE G.23: Built by the Swiss Adastra Company, this machine carries 10 passengers. An idea of the size is provided by placing on one of the wings of the large machine, the Bahnbedarf B.A.G.I. light monoplane with Blackburne "Tomtit" engine.